Since it was revealed that the vast majority of people seek and accept friend recommendations when considering a purchase, marketers are not only running well optimized Facebook ads and Adwords campaigns but, they have been doing their best to make the most of word-of-mouth marketing and social referrals. 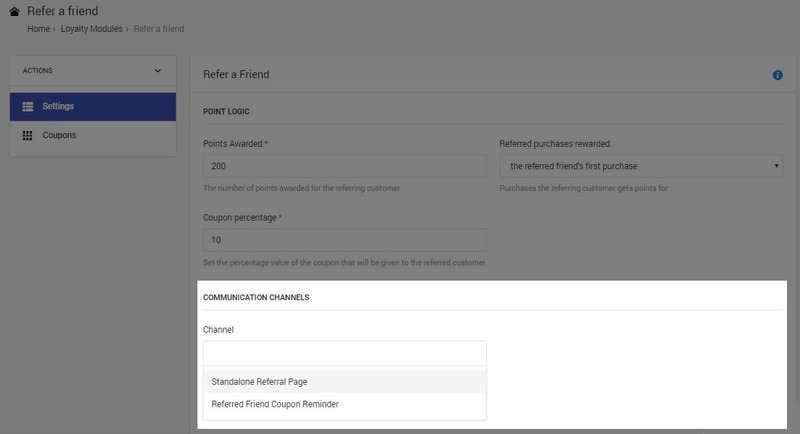 By using the Friend referral module, you can track your customers’ referrals and incentivize them to invite their friends to shop in your store for points. When a new visitor clicks on the referral link for the first time, a popup will appear, displaying a coupon code. The loyalty member will receive loyalty points if the invited friend uses the coupon code in the checkout process effectively. Referrals are at the very heart of advocacy, which is why we incorporate referrals into our calculation of the advocacy score on the Brand Advocates list. Find the Friend referral module’s configuration page by clicking on the ‘Modules’ link in the top menu bar, then selecting the ‘Gamification modules’ from the list on the left-hand side. From there the Friend referral ‘Settings’ tab will open up. 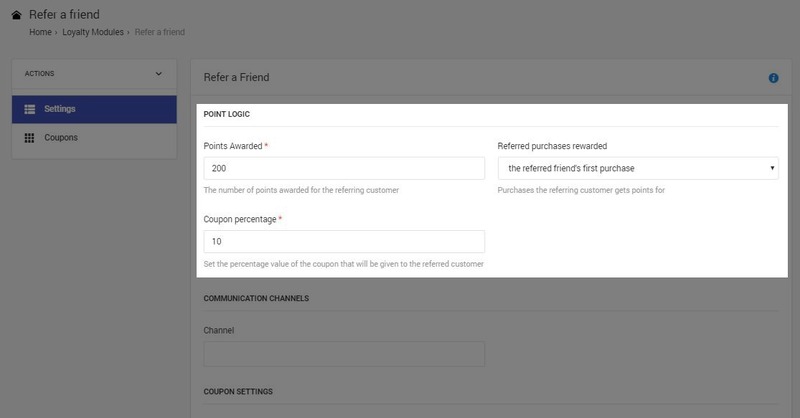 In the first section, you can set up the point logic that will be the basis of rewarding your customers for referring their friends. We recommend only rewarding the first purchase, to maintain control over the total number of points that can be earned with this module. Select the percentage value of the coupon that will be given to the referred customer. In order for the module to work correctly, you should set a non-zero value here. We recommend setting the percentage between 10-30%, so that the discount value is enticing enough for first-time shoppers to make a purchase, without “over-rewarding” those newcomers. You can send a test email to yourself by click the hamburger button on the ‘Emails’ page, to see how the email will look from a loyalty program member’s perspective. 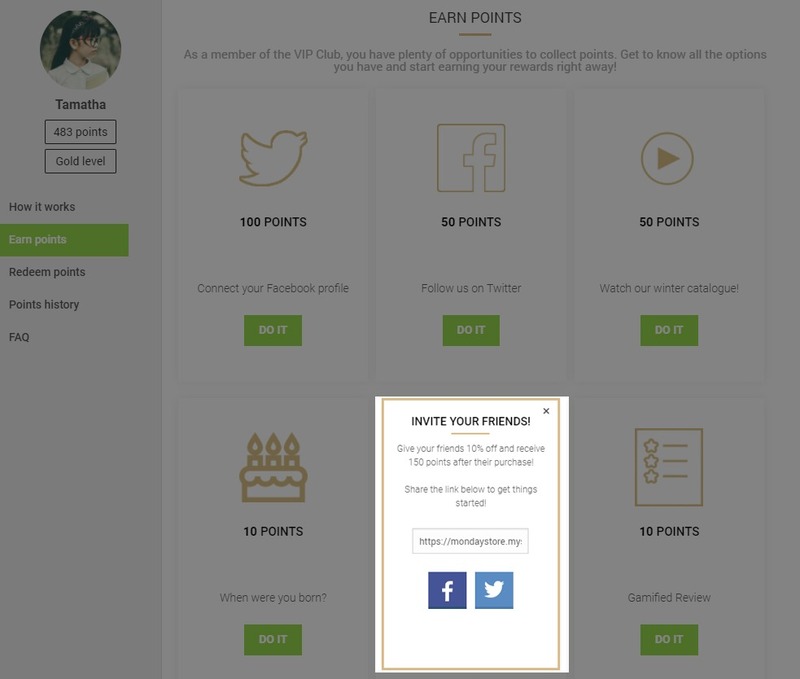 The dedicated page for your referral program will appear as a separate menu item in your Loyalty Hub. On this page, your customers can find their unique share link and follow the invites they’ve sent and the points they earned. Choose coupon source. You can choose to upload your own list of codes or the Antavo platform can generate codes on your behalf. When 90% of the coupons have been claimed, our system will send you a notification that your coupons are running low. Remote: if you’d like to maintain more control over coupon management, you can set a callback URL endpoint that serves us with coupon codes to issue. When the module is enabled, program members can learn about friend referrals in the Loyalty Hub. The reminder appears as a card alongside the other actions customer can take to earn points. In the third section of the module configuration page, you can define the content of the card. Each card appearing in the Loyalty Hub has a front and a back side. On the front you can see the title and the custom image that you’ve just set, and the number of points you can get for a referral, alongside a CTA button that flips the card over to display the back side. On the back of the card, customers can find the title and the description added in the configuration interface. Here’s where customers can find the link to share or sharing buttons to use in order to be able refer their friends. At the end of the setup process, please don’t forget to click on the ‘Save’ button. 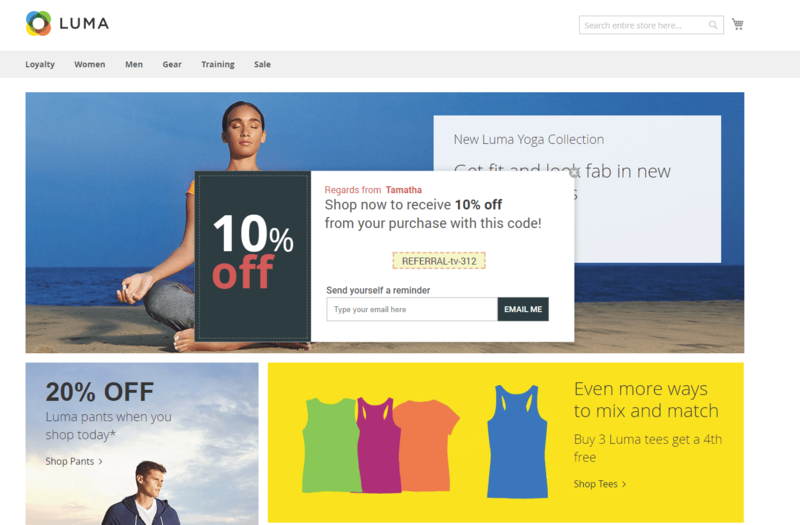 The pop-up that displays the coupon code for the new visitor is automatically added by Antavo. To customize this popup, please consult your Onboarding manager. You can choose to add a post-purchase popup that appears after a customer has made a purchase in your store. The popup will allow your customers to invite their friends on multiple social networks. Friends can also be invited by sharing the unique referral link. If you want to use this popup, please consult your developer, who needs to implement the popup into your post-purchase page. 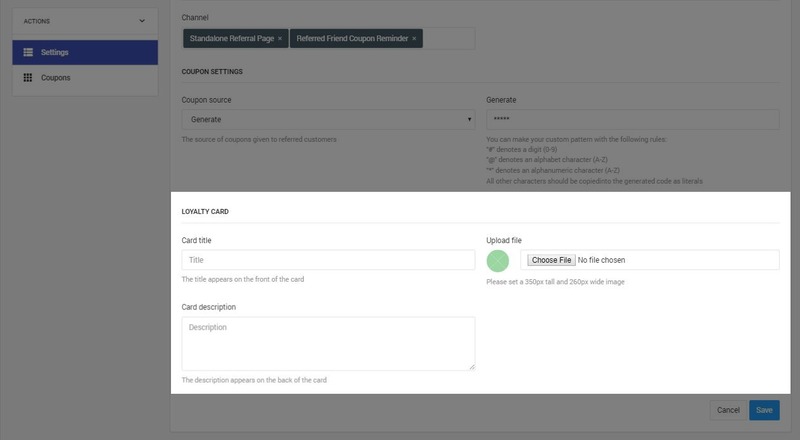 In order to support this module, you need to use the Antavo Loyalty Plugin in your Magento / Magento 2 / Woocommerce store or implement a few changes in your Custom CMS. Besides basic implementation, please follow the additional technical instructions for this module in our developer documentation.